A group of U.S. military veterans, standing in defense of Indigenous rights, has vowed construction of the Dakota Access Pipeline will never be completed — and will put boots on the ground to ensure it. 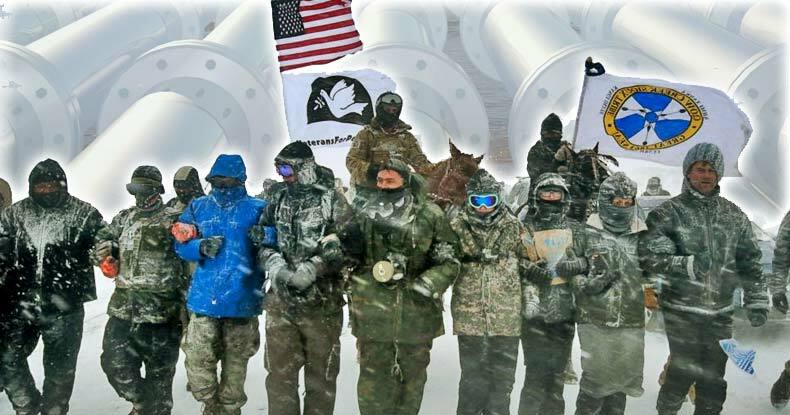 As staunch a stance as that might sound, the veterans remain committed to nonviolent action in defense of the Standing Rock Sioux against Energy Transfer Partners, the company responsible for pipeline construction. On Wednesday evening, heavily militarized and armed police and National Guard forces advanced en masse across Highway 1806’s Backwater Bridge for the first time in months to clear out a newer camp. At least 76 people were arrested, ostensibly for trespassing on private property — though the Morton County Sheriff’s Department told the Guardian on Wednesday specifics of the charges had yet to be determined. Law enforcement moved to clear the camp just one day after Secretary of the Army Robert Speer told the U.S. Army Corps of Engineers to grant ETP the easement required to complete drilling under the Missouri River’s Lake Oahe reservoir — the source of Standing Rock’s drinking water and the subject of furious contention over Dakota Access. Speer’s command also follows the recent signing of executive orders by President Donald Trump for completion of both the Dakota Access and Keystone XL Pipelines — despite the latter being shot down by former President Obama. Further indicative of a coming law enforcement crackdown on camps of water protectors, on Thursday, officials from the Bureau of Indian Affairs, tribal police, the ATF, the Standing Rock division of Fish and Wildlife, and USACE showed up unannounced and without a warrant on the property of LaDonna Tamakawastewin Allard to “assess” the Camp of the Sacred Stones. Livestreamer Johnny Dangers captured officials on video refusing to offer explanation beyond the vague ‘assessment’ for their presence on Allard’s private property. Sacred Stone, as the camp is commonly known, is the original site erected for youth water protectors opposing pipeline construction; and — being located on private land — was believed immune from law enforcement efforts of eviction. Worse, as Dangers and Allard said on social media, Standing Rock Sioux Tribe council appears to have asked officials to descend on the property — making the ‘raid’ a duplicitous act. “We have been betrayed by Standing Rock Tribal Council,” Allard posted to Facebook when officials arrived and refused to produce a warrant. In December, tentative celebration erupted when USACE halted pipeline construction in order to perform an exhaustive environmental impact study before granting the aforementioned easement. But Energy Transfer Partners — cognizant of the Trump administration’s favoritism of Big Oil — vowed Dakota Access would be completed without deviation from a planned path under Lake Oahe. Now, the two raids — and an increasingly intolerant attitude toward camped water protectors by both law enforcement and certain members of the tribal council — seem to evince coming action to evict and arrest water protectors still occupying floodplain land at several camps, including the largest, main camp, Oceti Sakowin. But the veterans group doesn’t want to let that happen. Several violent attacks led by police against unarmed and prayerful water protectors have left hundreds injured — several permanently — and have fueled worldwide consternation over the U.S. government’s corporate fealty. But, given concerted efforts by ETP — whose CEO Kelcy Warren donated $100,000 to the president’s campaign — to ensure the oil flowing through the Dakota Access Pipeline would be legally permitted for export and profit, anti-pipeline actions around the country should expect similarly oppressive measures from the Trump administration. With water protectors vehement about staying put in Standing Rock to halt construction of Dakota Access Pipeline for good, assistance from Veterans Stand will undoubtedly be welcome.